I can't remember the last time I went to see a Disney film in the cinema and when I saw the ad for this film I knew I was going to love it, I love every Disney film anyway. The film is about the workings of the human brain, in a very Disney way. Disney personifies the human emotions of Joy, Sadness, Fear, Disgust and Anger. These are the characters that are in control of our emotions and how we're feeling, done super cutely. 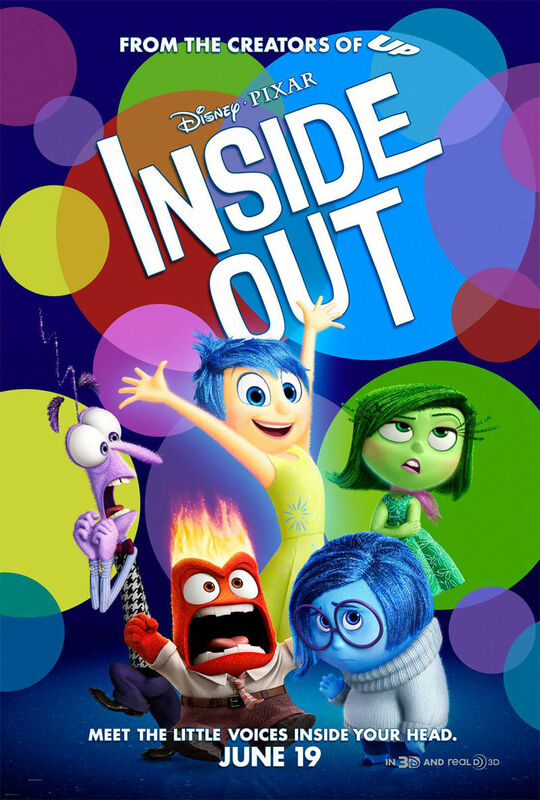 The film is inside the mind of one child Riley, who's just moved house and is feeling a range of emotions and for the emotions, they have to try and keep her happy. The film follows the journey of Sadness and Joy who get lost inside Riley's mind and have to get back to make her happy again basically. I loved this film! It has everything you would expect from a Disney film. The characters are super lovable, the story line is a great concept, it's fun and it's humorous. It's its own world and it's full of really creative things like imagination land. They try to explain everything about how they think the brain works in such a cool way, like why we dream things that we do and why we get certain songs stuck in our heads all the time. It deals with the falling apart of friendships and family relationships and how to cope with it. At one point in the film, which I think is on the ad, you get a glimpse into the brains of Riley's parents too when they're having an argument, it's really well thought out and everything links back to everything in it. It gets emotional at parts, but maybe that's just me. It deals with letting go of childish behaviours and growing up and there's always that one part in Disney films that makes me want to cry, and of course this film has it. Overall I found this film super quirky fun and something that I'd happily watch seven times in a row. I know not everyone will feel the same, but as a Disney lover I'm probably just a bit biased. Has anyone else seen this or want to go see it?